Reviewed by Ronnie D. Lankford, Jr. While less known than the Lomaxes, Frank and Anne Warner made a number of recordings over a forty-year period of time and donated them to the Library of Congress in 1972. Now, thanks to Appleseed, these recordings have been made easily available for scholars, lovers of old-time music, and the curious. The Warner Collection, Vol. II concentrates on the music of singer, guitarist, and banjo player Frank Proffitt. His recordings represent almost half of the selections here. Proffitt had a deep love for music and played hundreds of songs for the Warners, with whom he developed a close friendship (they would save 250 of Proffitt’s letters). Unfortunately, the Depression continued to have an impact on the Appalachians, even as late as 1951, forcing him to sell his guitar and give up music for a number of years. Today, Proffitt’s name is primarily associated with the famous murder ballad, Tom Dooley. There are two versions of Tom Dooley” on The Warner Collection, Vol. II. The first is from 1940 and lasts only 44 seconds. “My earlyest (sic) memory was of waking up on a wintry morning,” Frank Proffitt wrote, “and hearing my father picking the Tom Dooly (sic) song in a slow mournful way.” Proffitt would teach the song to Alan Lomax who published it in Folk Song U.S.A. In 1959, the Kingston Trio recorded the song and it became an international hit. Their version, however, only partially resembled the original. “I got a television set for the kids,” Proffitt wrote. “One night I was a-setting looking at some foolishness when three fellers stepped out with guitar and banjer (sic) and went to singing Tom Dooly (sic) and they clowned and hipswinged (sic). I began to feel sorty sick, like I’d lost a love one.” Proffitt recorded the second longer version of Tom Dooley in 1959, fully capturing the pathos of the ballad. While Proffitt is the star here, he is joined by a number of talented singers including Lee Monroe Presnell, Linzy Hicks, Eleazar Tillett, Buna Vista Hicks, and Frank Proffitt, Jr. The quality of the recording, as with the previous volume, is excellent. Proffitt’s music would eventually lead to opportunities that would improve his financial security (although it would take an extended legal battle to gain royalties from Tom Dooley). He recorded for Folkways and Folk-Legacy, played at Newport, and even received a cover article in Sing Out! The Warner Collection, Vol. II is a perfect way to introduce the wonderful music of Frank Proffitt and North Carolina to a new generation. See previous Frank Proffitt post. In 1958, a new song called “Tom Dooley” meant a national hit for the Kingston Trio. For Frank Noah Proffitt, it meant that part of his heritage had suddenly been launched into national fame. Born to Wiley Proffitt and Rebecca Creed Proffitt on June 1, 1913, in Laurel Bloomery, Tennessee, Frank moved to and grew up in Pick Britches, now known as Mountain Dale, at the foot of Stone Mountain in Watauga County. He learned how to make banjos and dulcimers from his father. Wiley Proffitt was not the only family member who taught young Frank folk songs and instrument-making. Frank learned traditional folk songs from his aunt, Nancy Prather, and from his father-in-law, Nathan Hicks, who also made dulcimers. His grandmother, Adeline Perdue, who lived in Wilkes County during the Tom Dula trial, taught Frank “Tom Dula.” According to family legend, she saw Tom riding in a coffin, and as he strolled down the street to his hanging, he sang a song–the same song she taught her grandchildren. As a family man, Frank made his living growing tobacco and strawberries and making instruments as his father and father-in-law had done. One day in 1937 a couple from New York named Warner visited them to buy one of Nathan Hicks’ dulcimers. 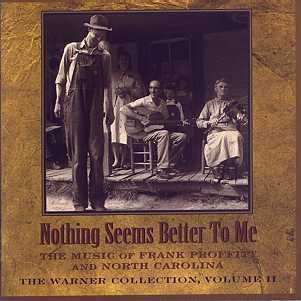 The man, Frank Warner, was particularly interested in learning Appalachian folk songs, and Nathan sang some of the ones he knew. The next year, when Frank Proffitt was visiting his father-in-law, Frank and Anne Warner returned, and Proffitt sang “Tom Dula” for them. “His eyes sparkled as I sing Tom Dooley to him and told him of my Grandmaw Proffitt knowing Tom and Laura. I walked on air for days after they left,” Frank said about Frank Warner’s visit. The Warners used one of the first battery operated recorders to capture the songs Frank sang for them.